Squeezing tart, bright yellow lemons and consuming the juice they give you delivers numerous health benefits. Nearly every type of ethnic cuisine uses its lemon juice as a flavor enhancer or tenderizer. While lemon juice is quite astringent, it is also very refreshing, high in vitamin C and contains compounds that may help prevent cancer. Lemons and their juice are rich sources of vitamin C. A 50 gram serving of fresh lemon juice, or slightly less than 1/4 cup, provides 23 milligrams of vitamin C -- over 33 percent of the recommended daily value, or DV. Vitamin C, like vitamins A and E, is an antioxidant that supports immune system function. In addition, it helps protect your cells from free radicals, which can cause significant damage. Free radicals are charged atoms that are formed when certain molecules interact with oxygen, according to the National Cancer Institute. They react with cell membranes and the DNA within cells, impairing their function. Damaged cells are the first step leading to cancer development. Choosing a diet high in antioxidants, from fruits and vegetables, play a role in cancer prevention. Lemons and limes contain disease-fighting compounds known as limonoids. 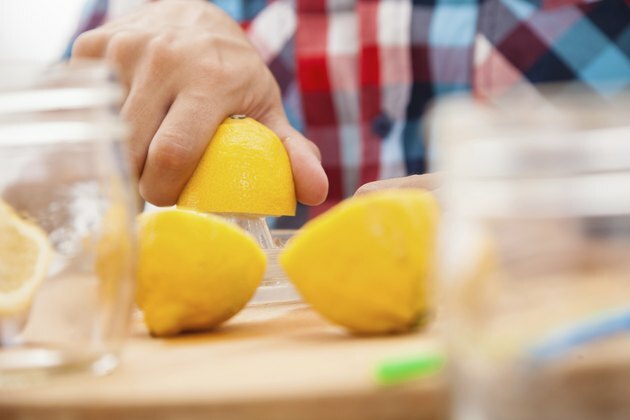 The human body is able to readily absorb a specific, long-acting limonoid known as limonin, according to the US Agricultural Research Service. Both lemons and limes contain nearly as much limonin as they do vitamin C. The results of a 2001 culture study summarized in "Nutrition and Cancer," revealed that this compound, at a concentration of 100 micrograms/mililiter, was effective at partially inhibiting the growth of human ovarian cancer cells and inducing the death of breast cancer cells. Three years later in the "Journal of Agricultural and Food Chemistry," researchers discovered three new limonoids. Two of these limonoids, obacunone and deoxylimonin, significantly reduced the number and burden of induced oral-cavity tumors by 25 to 50 percent. While outdoor grilling is a popular, low-fat, heart-healthy cooking method it is not without some health risks. There are two classes of cancer-causing substances, or carcinogens, found in high concentrations in grilled meats. Heterocyclic amines, or HCAs, are formed when fish, poultry, beef and pork are cooked at high temperatures. Polycyclic aromatic hydrocarbons, or PAHs, form on the meat's surface by flame and smoke flares, which occur when the juice of the meat drips down onto the heat source, according to the Cancer Project website. There are methods for minimizing the formation of these compounds. One of these methods is marinate meats in marinades that contain anti-oxidants, especially herbs, vinegars, olive oil, spices and citrus fruit juices, such as lemon. According to Purdue University Animal Sciences, this helps inhibit the formation of carcinogens on grilled meat. What Are the Health Benefits of Concord Grape Juice & Cranberry Juice?